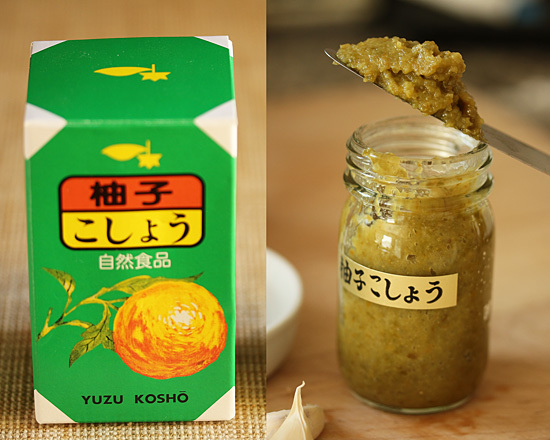 I have really been enjoying cooking with this new-to-me ingredient, yuzu kosho. So far I have made Grilled Scallops with Red Yuzu Kosho Vinaigrette and Grilled Tomatoes with Red Yuzu Kosho and Sansho. Now, with this recipe we are using green yuzu kosho, which is made from green yuzu zest and green chiles, and is less spicy than the red. But so interesting. 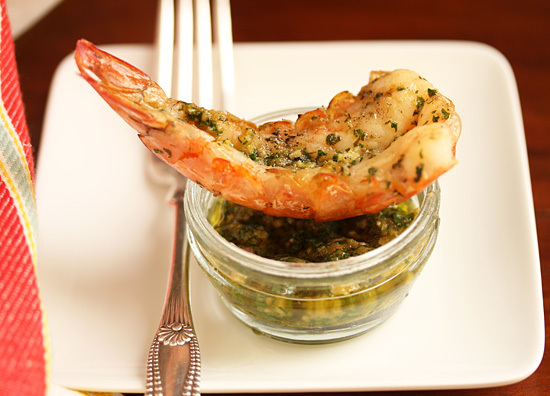 The recipe for Spicy Grilled Shrimp with Green Yuzu Kosho Pesto comes from Chef Ricardo Zarate, who helms the wonderful Puruvian fusion restaurants Mo-Chica, Picca and Paiche in Los Angeles. In 2011, Chef Zarate was awarded the title of Best New Chef in America by Food & Wine Magazine, and this recipe was in the July 2011 issue. I have been saving this recipe for 2 years, waiting until I figured out what yuzu kosho was. Now I know and here it is. I found green yuzu kosho at my local Japanese market, and also ordered it on Amazon. They were different brands, but tasted very similar. You can see the texture in the photo, which is a little thicker than a standard pesto. Yuzu is a citrus fruit which originated in China and is now used mainly in Japanese and Korean cuisine. It looks like a small grapefruit and can be yellow or green depending on its ripeness. Its flavor is tart, closely resembling grapefruit with overtones of mandarin orange. It is rarely eaten as a fruit; the zest and juice are used mainly as seasoning. The shrimp are butterflied down the front in the shell and opened flat. 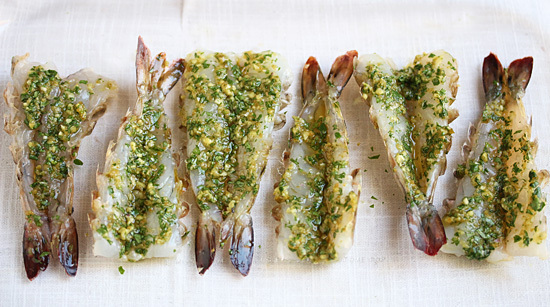 The pesto, which is made with green yuzu kosho, minced fresh ginger, garlic, lemongrass, cilantro and olive oil, is spread on the shrimp to marinate. Grilled flat until slightly charred, then turned over to finish. My mouth was watering as I grilled. I couldn’t wait. Smelled so good. And tasted amazing. You could serve one shrimp as an amuse-bouche, or several as a starter for that Puruvian fusion meal you are planning to make. Or eat them all yourself, which is probably what I would do. Just sayin’. 1. To butterfly shrimp, slit from end to end down bottom leg-side of shrimp, through almost to shell, but NOT through shell. Bend sides back to make flat, press on hard surface if necessary. Remove black intestinal vein. Place meat side up in flat dish, such as 9×13 glass pyrex. 2. In a small bowl, combine green yuzu kosho with minced ginger, garlic, lemongrass, cilantro and olive oil. 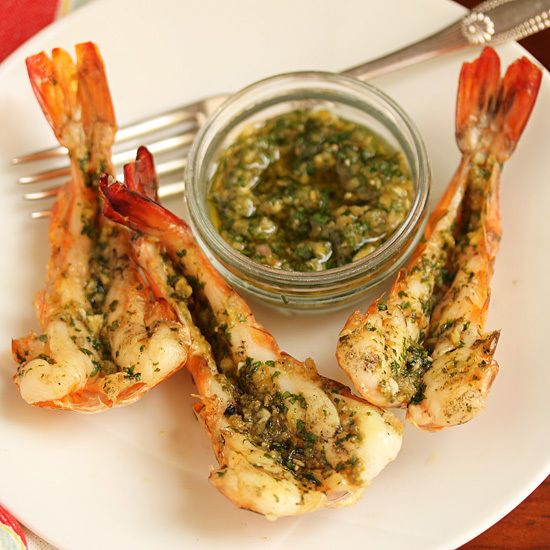 Spread half of pesto on meat side of shrimp only and let stand for 10 minutes. 3. Light grill or preheat a grill pan. 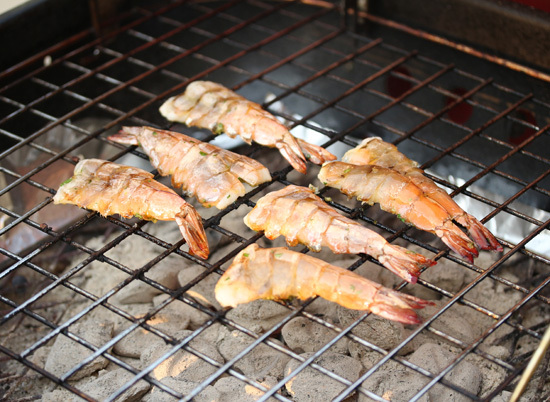 Grill shrimp over high heat, turning once, until lightly charred and cooked through, about 4 minutes. 4. 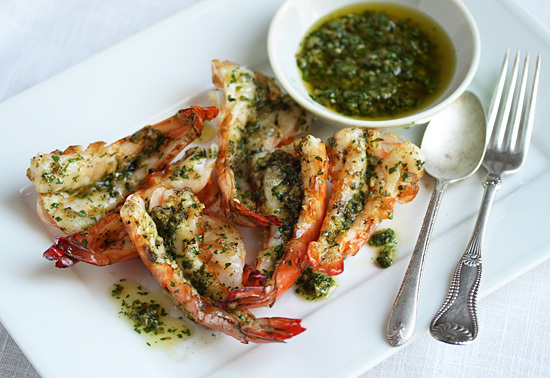 Transfer shrimp to plates and serve with remaining pesto. Note: the green yuzu kosho pesto can be made and refrigerated up to 2 days ahead. Looks delicious! Beautiful photos as always Lynne! Wow! That is so amazing looking! You could start your own yuzu restaurant! Sleep on it. Can’t wait to make this tomorrow. I just love the Yuzu Kosho on just about anything!